To be able to save an Ibot, you must have performed the initial configuration. When you want to set up the smtp server for a computer which move from one network to a another, the smtp server must be a secure SMTP. Because to fight against SPAM, you are often only permitted to send a mail against a non secure SMTP from your network. If you don’t know your secure smtp port, a simple search on Google will give you all this details or best, you can go on your provider website. 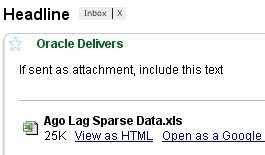 It is the smtp parameters of my company but my laptop is at home. 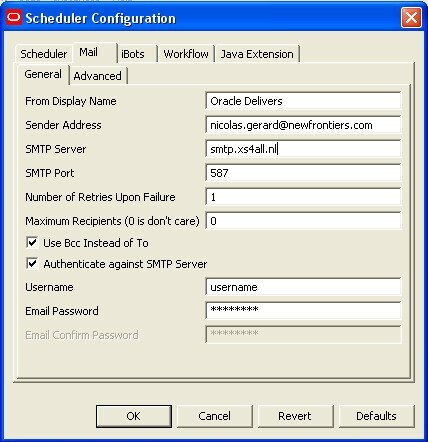 Before we continue, you must verify your smtp parameters with telnet for instance : Email - How to verify your SMTP connection and parameters (TSL/SSL) with TELNET ? Enter your parameters. Save them and restart the Oracle BI Scheduler Service. In Oracle BI Presentation Service, click on the link Setting and select my account In the device part, click on the link “Add Email Device” and enter your email. select in the destination tab “Email”. I have scheduled the period to period comparison lag report with an excel attachment. Obiee 10G – How to suppress detail rows of a master group in a pivot view ?